When disengaged, a well balanced door should open with just two fingers (in most cases – not all) . 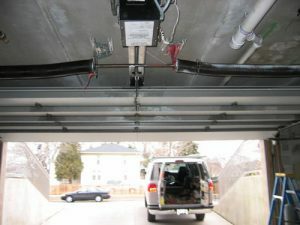 The spring allows the garage door opener to raise and lower the door with minimal effort. When a spring snaps, your garage door often will not open, leaving you and your car trapped! Luckily, we can come to your rescue! Give us a call at (630) 271-9343 for same day, low-cost spring replacement. There are many different types of garage door springs. Every spring has a set life expectancy that can be accurately calculated based on the springs dimensions, and the height and weight of the door. Most normal residential garage doors come with “standard cycle springs” that are rated for 10,000 uses. Innovative Garage Door uses a minimum 25,000 cycle torsion garage door springs on all doors, upgraded torsion springs available upon request or suggestion. Broken Springs are commonly encountered in garage door repair. High frequency of use can cause garage door springs to wear out quicker than usual. For torsion garage door springs or extension springs, or any garage door repair in Chicago call us today!